The eBA Stats Group BASKETBALL VIDEO COLLECCTION was MOVED to the eBA FORUMS! Coach Eastman covers a lot of ground in this course, including diagrams and demos in several of the lessons. NBA and College Basketball Coach 35+ Years; Speaker to Sports and Corporate Teams. Over his 40 years in the game of basketball at the collegiate and professional levels, Kevin Eastman has studied what makes the best The Best -- their habits, mindsets, strategies and every day choices. Known as a thought leader in the basketball and sports worlds, Kevin is now an engaging speaker who inspires a wide range of audiences, from sports teams to diverse corporate groups. El entrenador Eastman cubre mucho terreno en este curso, incluidos diagramas y demostraciones en varias de las lecciones. Entrenador de la NBA y del Baloncesto Universitario durante más de 35 años; Orador y Expositor para Equipos Deportivos y Corporativos. The "Cincinnati 1-on-1" Drill NEW TRAINING VIDEO from Buffalo's Nate Oats! El Ejercicio "Cincinnati 1-contra-1" NUEVO VÍDEO de ENTRENAMIENTO por Nate Oats! TRAINING VIDEO from Buffalo's Nate Oats! Paying mind to all of these will lead to stops on the defensive end and allow your team to push the ball in transition and play at a faster pace. The "Cincinnati 1-on-1" Drill from Buffalo's Nate Oats! VÍDEO de ENTRENAMIENTO por Nate Oats! Prestar atención a todo esto conducirá a paradas en el lado defensivo y permitirá a tu equipo empujar el balón en transición y jugar a un ritmo más rápido. Defense wins championships! Good teams are able to understand and apply key defensive principles and skills. In this informative course, Coach Al Sokaitis presents a detailed overview of key defensive concepts and strategies for high school basketball teams. The program covers man-to-man defense, pressing and trapping, and the match-up zone defense. 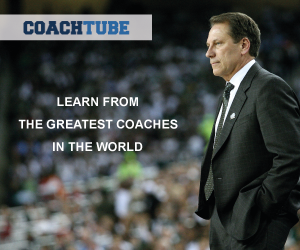 This course is a must have resource for high school coaches. Al Sokaitis has been coaching basketball for over 35 years at various high schools and colleges. He has established records for the most wins at several different schools, and been named Coach of the Year on numerous occasions. Sokaitis has been a collegiate men’s head coach at North Adams State in Massachusetts; University of Southern Maine; and Western State College in Colorado and Post University in Connecticut. Al Sokatis is one of the few coaches who have over 500th career coaching victories. La defensa gana campeonatos! Los buenos equipos son capaces de entender y aplicar los principios y habilidades defensivos claves. En este curso informativo, el entrenador Al Sokaitis presenta una descripción detallada de los conceptos y estrategias defensivas clave para los equipos de baloncesto de la escuela secundaria. El programa cubre la defensa de hombre a hombre, la presión y la trampa, y la defensa de la zona de emparejamiento. Este curso es un recurso indispensable para los entrenadores de secundaria.